How did we manage to transmit ever more digital signals with fiber optics? How do we shape light? 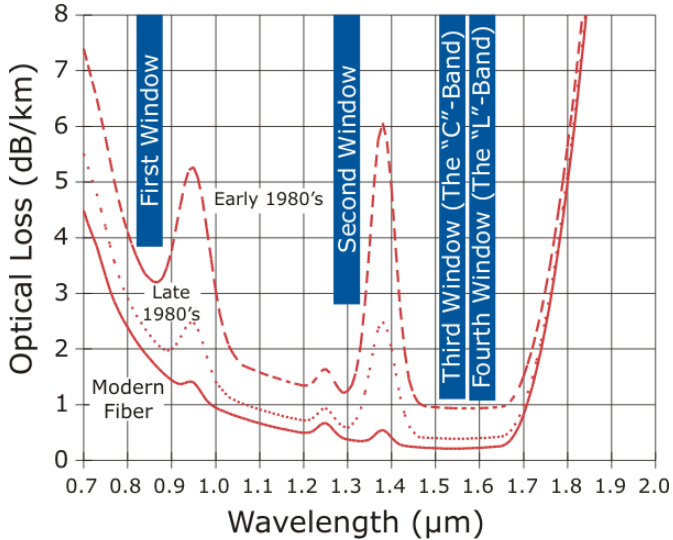 This blog post is not an introduction to fibers or optical components. If you want one, read this. Then read books, or ask me to write more articles! Couldn’t we be subtle? If we can tell them apart, why not use multiple intensity levels - and send 2 bits per period? At a given frequency (the baud rate), we can send more or less information depending on the number of symbols we use. Compared to more advanced modulations, turning the laser on/off or sending pulses can be done easy be directly controling the power sent to the laser/LED1. This is called direct modulation. We may want to avoid long sequences of 0 or 1: they may put the receiver clock out of sync! Because of this, we will avoid a direct encoding from bits to symbols. We can use a line code to embedd a clock in the signal, use a scrambler to remove unwanted harmonics, or even solve ambiguities in sophisticated modulations. We will now ignore bits and line codes, and focus on symbols! Reminder: optical fibers use light! Optical transmissions use… light! Talking only about the signal intensity is too simplistic. We are dealing with electromagnetic waves, and we will be using a laser signal – tuned at a specific wavelength – to carry information. Reminders: the intensity we drew earlier is a mean of the square of the raw signal. We can send multiple signals on a single fiber, each carried by a different wavelenth/frequency. Each receiver will filter the frequency it wants to read. This is called Wavelength division multiplexing (WDM). Does it mean we can send as many signals as we want? Not quite. How come our amplitude-modulated signals spread over an interval of wavelengths? Lasers are not precisely tuned, and this forces you to use some margin. For the best precision you must stabilize their temperature. Modulation widens the carrier signal’s spectrum. The extra frequencies are called sidebands. They span a bandwidth whose order of magnitude3 is the data frequency (~10GHz). There are more restrictions5! Optical amplifiers can only be used with a limited range of wavelengths… All others are limited to short-range applications. Today, we can use up to 88+ channels in each fiber. 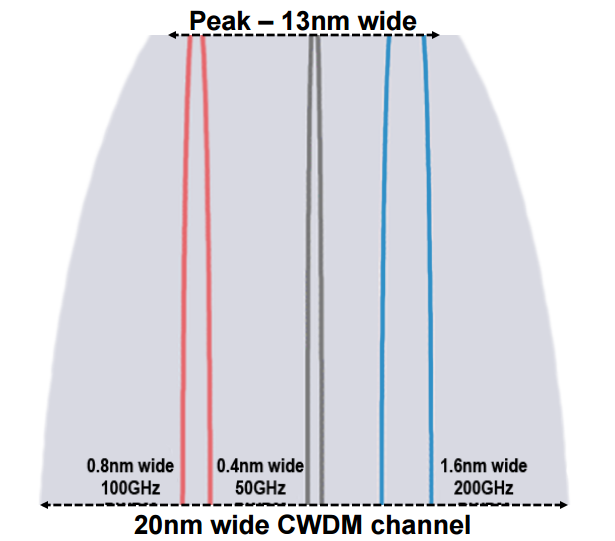 Ultra-Dense WDM will push the enveloppe further. When does direct reception stop shining? Noise is killing us on long distances. Can we send symbols more distinct than intensity levels? The sidebands of amplitude modulation are a big problem: they introduce chromatic dispersion, very sensible beyond 10Gbaud. The clock rate of our electronics (digital-electronic conversions) is ultimately limited. 60Gbaud is the ceiling. If you need to build a data transport network across the globe, you need a better6 technology: coherent optics. How do we send even more information? We can start by modulating both the carrier’s amplitude… and phase. Soon online: «What do we mean exactly by coherent optics ? How do we modulate and recieve the phase? In Binary Phase-Key Shifting BPSK, we send symbols by shifting the signal by half a period. The signal is now the projection of a late/early clock. On the left, you can recognize the symbols used. Signal over noise requirements end up limiting the constellation complexity. Earlier we mentionned that light is a wave, and that led us to exploit wavelength multiplexing (WDM). This said: in which direction does light oscillate? In optical fibers, light is a transverse wave: it can oscillates in directions perpendicular to the fibers’ longitudinal section. Luckily for us, receivers can be made to tell apart two orthogonal polarizations. Dual-Polarization (DP) gives us twice as many bits as before! 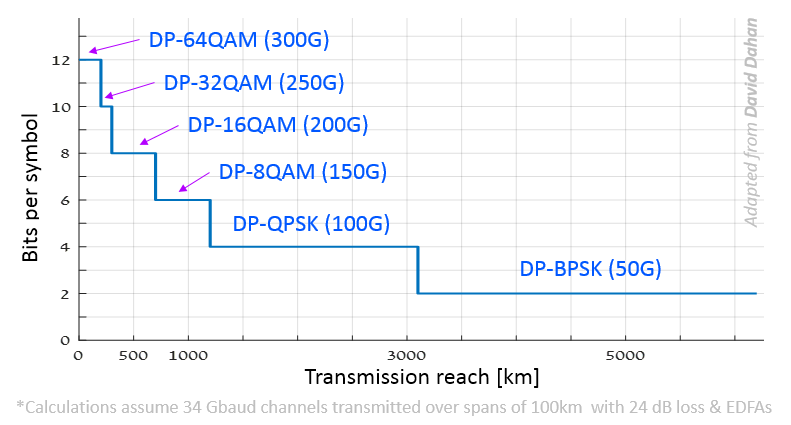 If (maybe because of the noise level) we cannot use DP-8QAM, we have to settle for DP-QPSK, thus losing 33% in bit rate. Can we be more flexible? Can we find something intermediate between DP-8QAM and DP-QPSK? In polarization multiplexing, we always send a even number of bits per symbol. However, we can sacrifice a bit of data for a «checksum» bit. Implementing this in a smart manner is not easy; it means finding constellations in the 4-dimensionnal space of dual polarization symbols… Read about Set Partitionning 4D. Probabilistic Constellation Shaping offers to use less the high-energy symbols, as they suffer more from noise. Line codes can use correlated successive symbols. Are you interested? 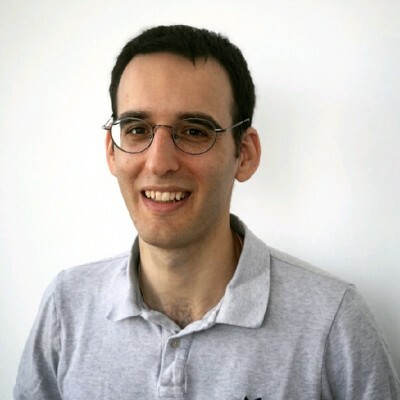 Our group works on optimizing optical networks using those technologies… We’re hiring!